Boulder Reporter » Can Commisioners and people stop Boulder County’s impending fracking assault? 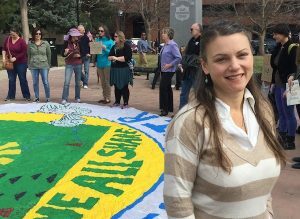 A small but fervent crowd of activists rallied in front of the downtown Boulder Courthouse Monday before the County Commissioners were scheduled to meet and discuss the near-term arrival of fracking to Boulder County. Time is running out, as Boulder County threatens to be littered with fracking wells, with all their attendant noise, visual air pollution and related health hazards. The county’s moratorium on fracking is scheduled to end May 1. A scary 1800 fracking wells may pop up in the county. Merely regulating fracking’s excesses is not enough, as speaker Sara Barwinski, a former member of Gov. Hickenlooper’s Oil and Gas Task Force who has moved to Estes Park after seeing fracking up close and horrible in Greeley, told the roughly 150 people in attendance. The consensus of other speakers, who included Russell Mendell of Earth Guardians, Doug Good Feather of Spirit Horse Nation, Carolyn Bninski of Rocky Mountain Peace and Justice Center, Boulder attorney Dan Leftwich of MindDrive Legal Services, and Micah Parkin of 350 Colorado, was a call for an all-out, long-shot resistance movement to somehow make fracking’s rollout in Boulder County not happen period — or, at the least, work hard to somehow mitigate its extent and impact. Various fracking foes have spoken out eloquently about the hideous position we’re in. How bad could it get? 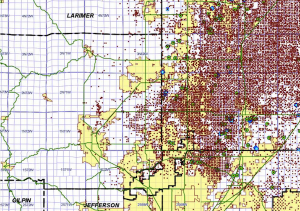 Look at the following map of the fracking wells to the north of us in Weld County. We are told to expect over 1800 fracking wells in our county in the next few months. There are proposals for drilling near residential neighborhoods, schools, parks, and recreational areas up and down the Front Range. Each of these sites would have 20 to 40 wells. At least one conversation overheard in the chambers involved jamming up Boulder County courts and the jail with hundreds of arrested protesters. Boulder County resident Rod Brueske called for a moment of silence for the future environmental protesters who “are going to be oppressed by the corporate government and militarized police force” before going on to say he and his family are willing to face multiple arrests to keep out fracking. Legislators in various states are exploring tougher anti-protest measures, up to and including arrests and trials on felony charges for nonviolent protestors, usually on the premise that they are interfering with commerce. Similar discussions of stricter laws, including felony charges for tampering with fracking equipent, are underway among Colorado state legislators. The Lafayette City Council in March considered, then elected not to pursue, a law explicitly exempting nonviolent demonstrations, such as blocking traffic, from civil or criminal charges. Boulder County has a long history of sporadic nonviolent political actions. The most famous was probably the resistance movement led by the Rocky Flats Truth Force to seek closure of the Rocky Flats nuclear weapons plant in the late 1970s. In today’s fiery political climate, with the word “resistance” on millions of lips, it’s not clear how “active” Boulder County’s anti-fracking activists will become. This article was updated March 15 with additional information.